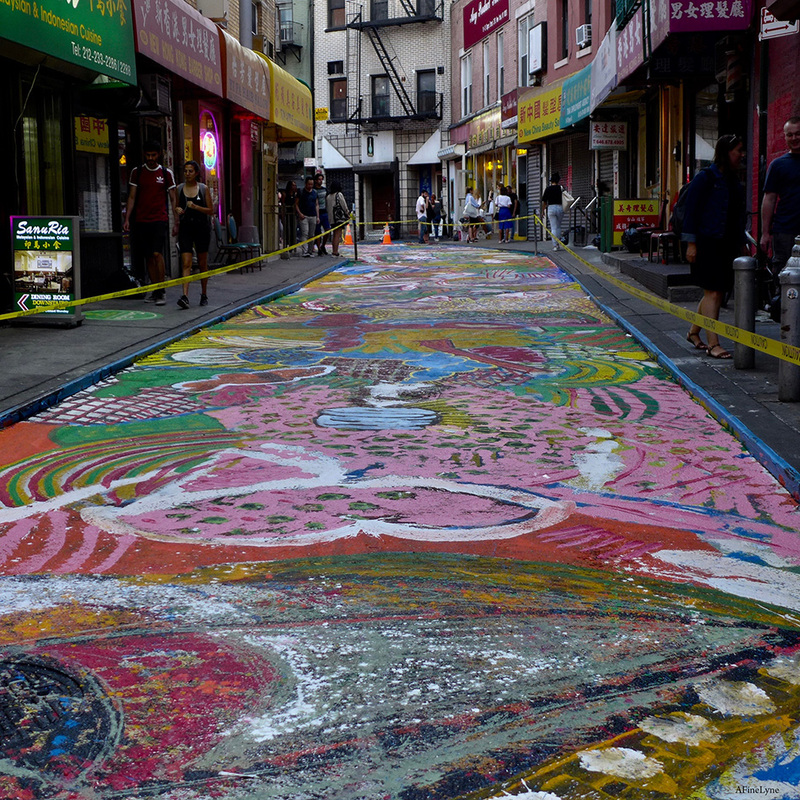 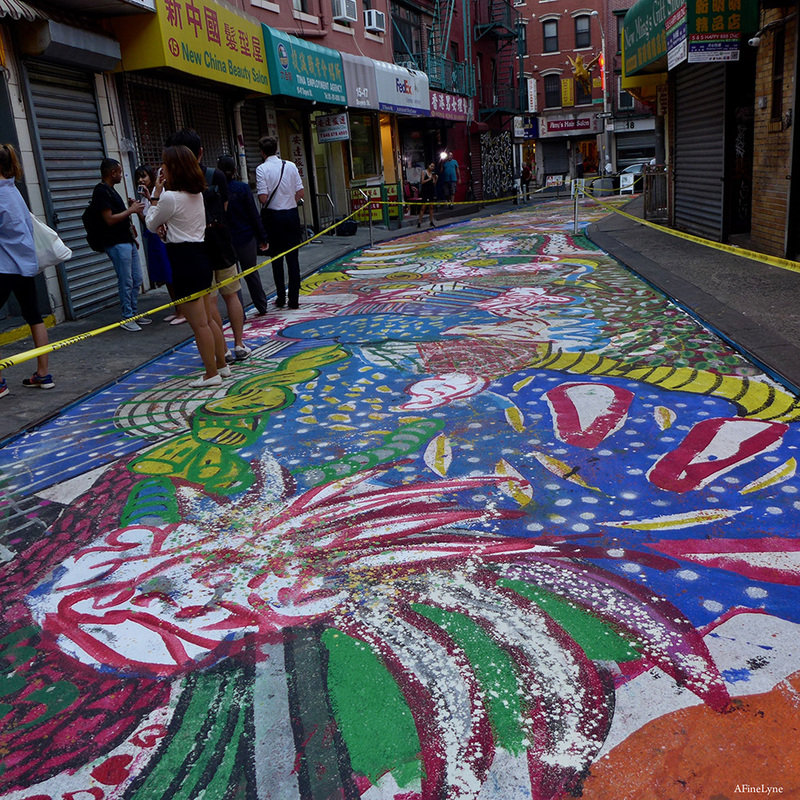 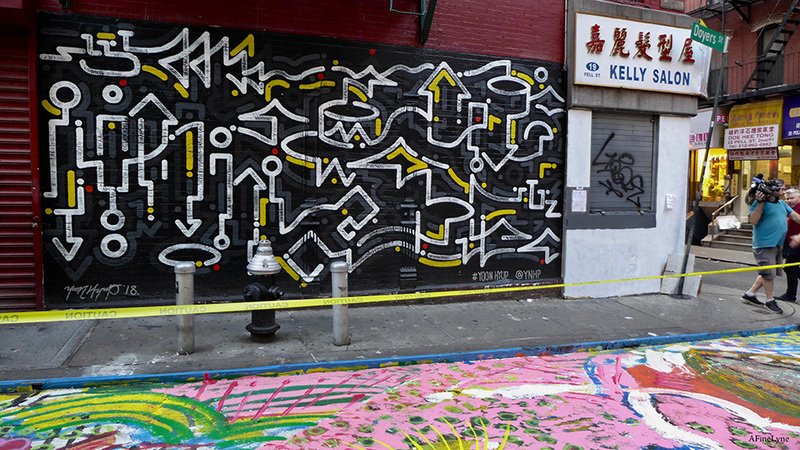 As part of the Doyers Street Seasonal Street, which begins on August 1st, Dongfan created a colorful 4,800 square foot mural on Doyers Street, which was once known as the ‘Bloody Angle.’ The mural runs the length of the winding 200 foot-long street, from Bowery to Pell Street, highlighting the historical significance of this tiny street and the history of Asian American immigration to the United States. 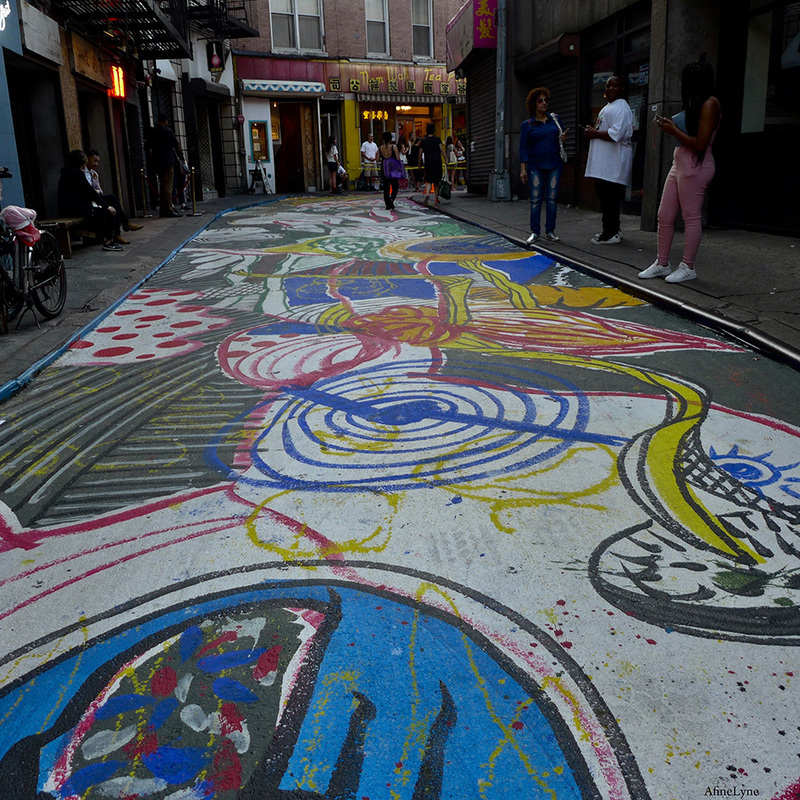 The artist describes his work as “not about dreams, but rather a kind of reality, a kind of memory, a mental world, the intersection between sensation and illusion, which requires time to find a way in.” The mural was drawing quite a crowd that indeed did stop and stare, all along the small, winding street, trying to find a way into its meaning ~ and very unsure if they should walk on it or alongside it. 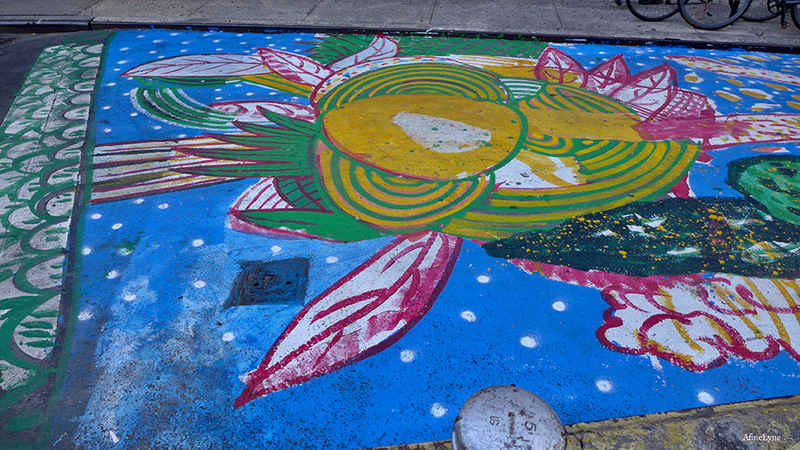 It is interesting to note that the paint used is removable and environmentally friendly. 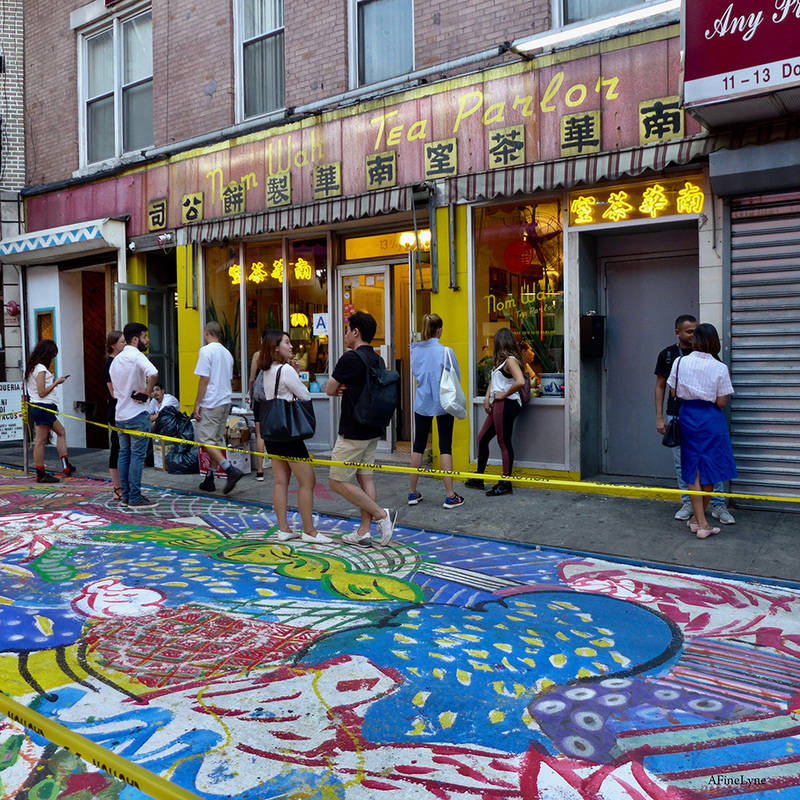 The images above and below have a view from the Bowery side, looking toward Nom Wah Tea Parlor. 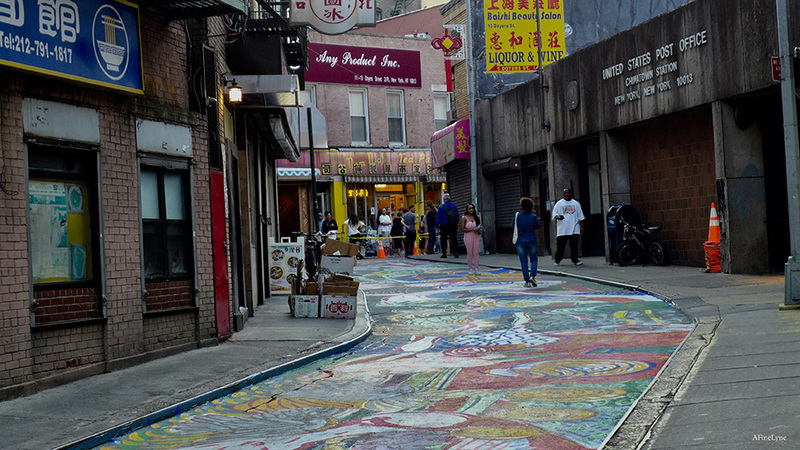 Below are a few more images taken on our stroll along Doyers Street. 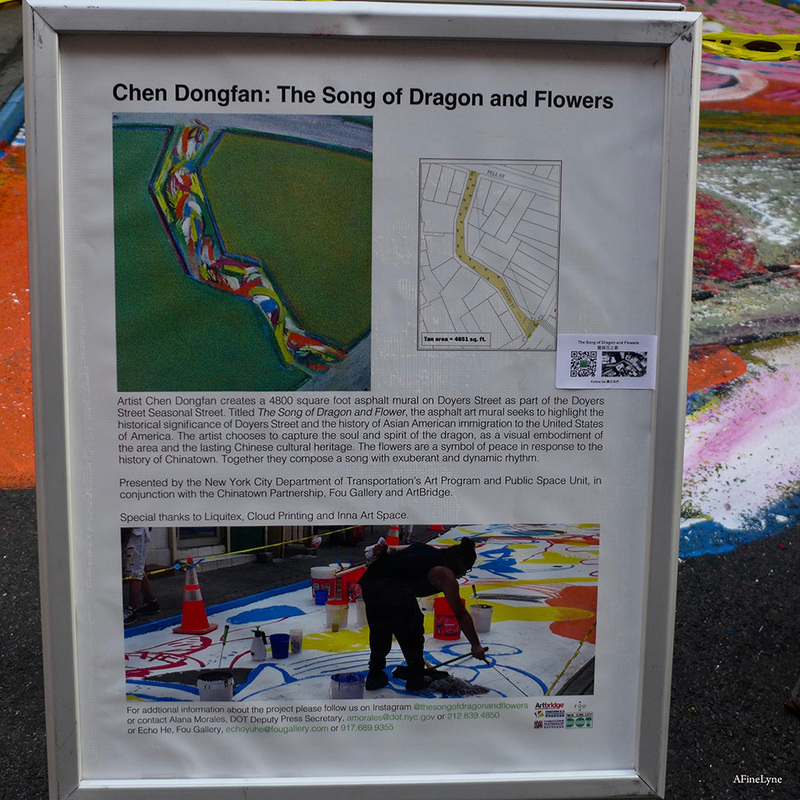 Chen Dongfan: The Song of Dragon and Flowers is a temporary public car-free space provided by the Chinatown BID, and NYC DOT. 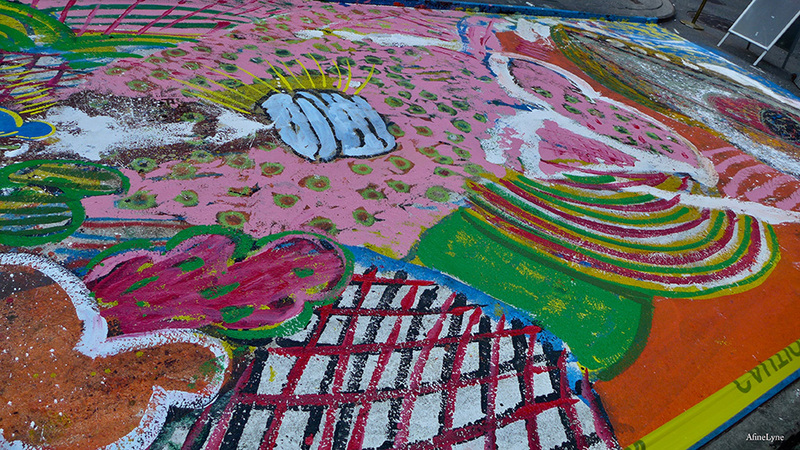 The colorful street mural will be on view to November 1st. 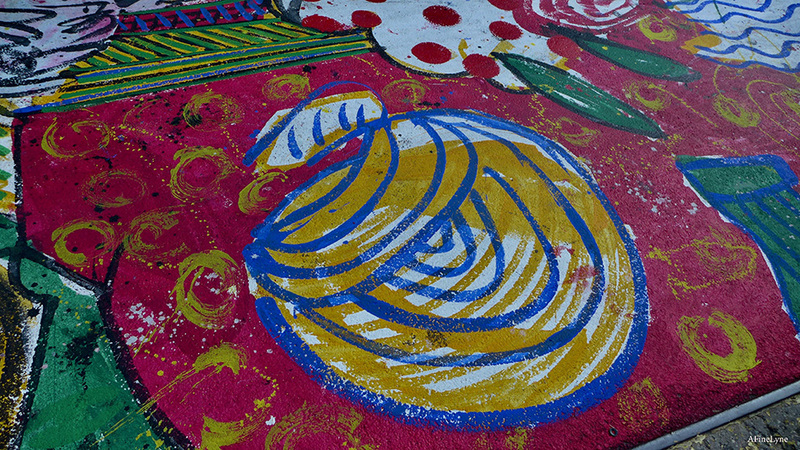 Opening Reception will be held on August 1st, with a time TBA. 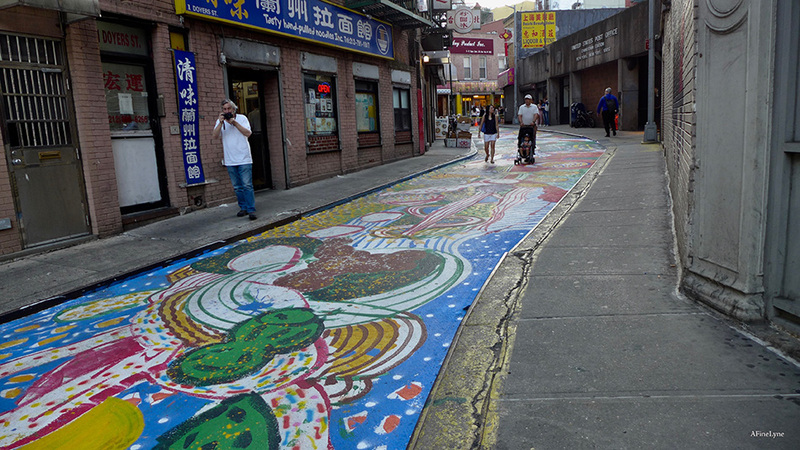 Chen Dongfan currently lives in New York and Hangzhou. 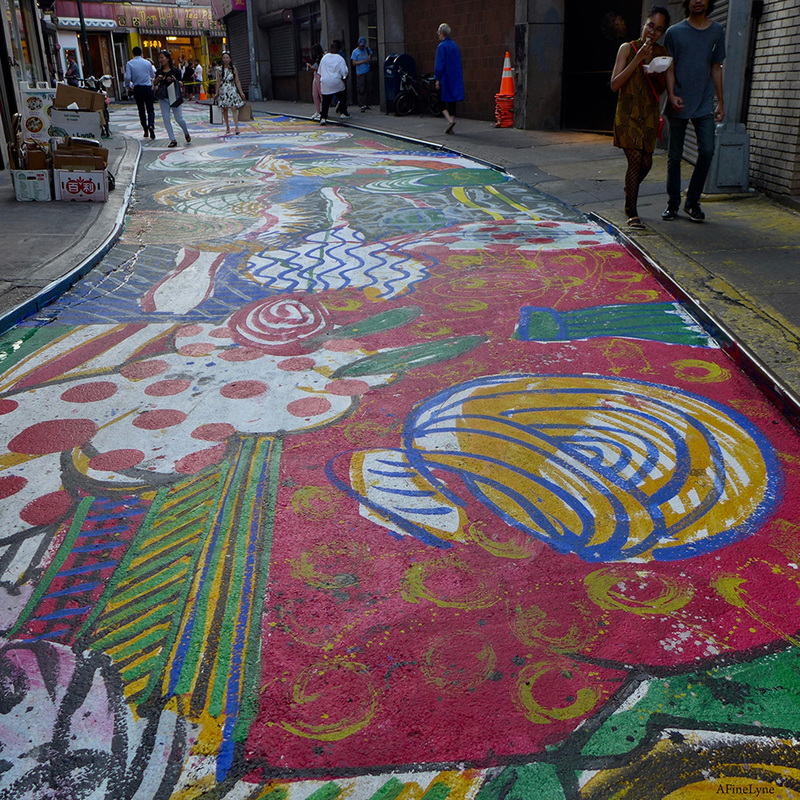 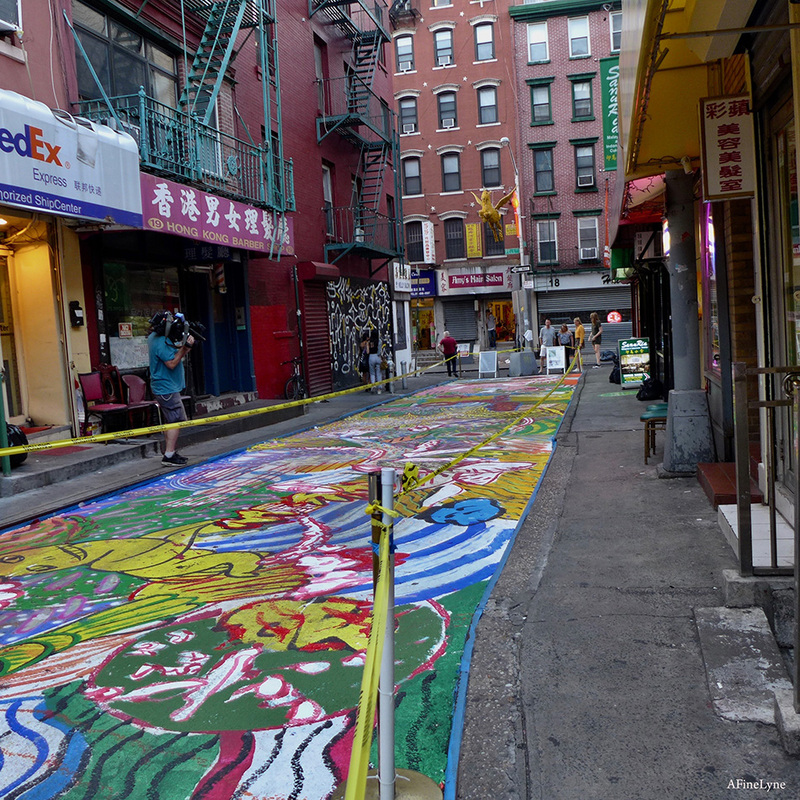 More on NYC DOT Art ~ including the recently painted Urban Garden in the Garment District.